Wie gut sind die Übersichten? Was erwartet uns noch an Erkenntnissen? Revisionszustand der einzelnen Reaktoren und deren unterschiedliche Bebenfestigkeit, sowie Unterschiede bei den Werkstoffen der Kessel. Die Position der Reaktoren in Bezug auf den Verlauf der Beben- und anschließenden Tsunami. Warum DER Beben? Es waren zwei. Und anschließend noch weitere Beben. Das "Alter" der Brennelemente, sprich, wie lange waren sie wo im Einsatz. Das spielt auch eine Rolle, wie lange sie einer Notsituation standhalten. Dabei spielt auch wieder das Material eine Rolle - welches Zirkalloy, welche Wandstärke usw. Was geht im Drywell ab im Normalbetrieb? Die neuesten offiziellen Meldungen sind ja eigentlich keine Überraschung. Wer hat geblaubt das die BS noch intakt sind? Bei den veröffentlichten Wasserständen (seit März) war das ja nun zu erwarten. Deswegen verstehe ich die ganze Aufregung nicht. @Dirk: Den Meisten, am Anfang im Blog beteiligten, war das schon in der ersten Woche klar. Aber das entscheidende ist die Informationspolitik und Transparenz von Meßwerten. Es hieß immer, dass die Brennstäbe eventuell oben - wo sie aus dem Wasser gucken sollten - etwas abgeschmolzen oder angeknackst etc. wären.  Significant melting of Uranium-"
Ich denke die neue TEPCO-Version liest sich inzwischen anders. Wir hatten uns vor Wochen schon in den Blogs mit den nötigen, entwickelten Wasserstoffmengen beschäftigt. Damit ist das was in den letzten 2 Wochen "offiziell" als möglich eingräumt wurde schon seit fast 2 Monaten so klar bzw. "wahrscheinlich". Übergangstemperatur 40% von der Schmelztemperatur von ca 1876°C das wären ~750°C. 876°C zerlegt Brennstäbe, ab 1227°C Hydration. So ca ^^ pi mal Daumen. Variieren, wie ich zum, finde, nur leicht, was die Umgebung betrifft. Sauerstoff wäre schlecht, entscheidender, finde ich, ist der Status des Abbrands. Sprichst du mehr oder weniger von AREVA Seite 16? BZW: was ist der Unterschied zu AREVA?  Melting of the steel structures"
 Unit 1: 300 to 600 kg.  Unit 2/3: 300 to 1000 kg." Sind das die Mengen von denen im Blog damals die Rede war? Nuclear fuel rods in the No. 2 reactor at the Fukushima No. 1 plant are believed to have mostly melted and dropped to the bottom of the pressure vessel 101 hours after the March 11 earthquake, and those in the No. 3 reactor likely reached the same state in 60 hours, according to Tokyo Electric Power Co.'s worst-case scenario. The worst-case speculation was based on the assumption the water level in the pressure vessels was lower than originally thought--similar to what happened in the No. 1 reactor. TEPCO's analysis of the state of the plant's reactors was submitted Monday to the Economy, Trade and Industry Ministry's Nuclear and Industrial Safety Agency. The report was the first admission by the utility that the reactors were in a critical condition soon after the plant automatically shut down when the earthquake hit. It is highly likely the pressure chambers of the Nos. 2 and 3 reactors were damaged when the melted fuel dropped down, which caused the hydrogen explosions, TEPCO's report said. Moin. Die Temperaturangaben sind Eckdaten für das genannte Material. Laborwerte sozusagen, als Anhaltspunkt. Vergesst nicht die Links darunter. und was heißt hier "The worst-case speculation" ?? TEPCO's report said about 800 kilograms of hydrogen was produced by this reaction, which leaked from the pressure and containment vessels to fill the building that houses the reactor. This massive amount of hydrogen is believed to be what caused the explosion at 3:36 p.m. on March 12. TEPCO had initially started injecting seawater into the reactor at 7:04 p.m. on a trial basis, but stopped after 20 minutes because the company had not properly informed the government of its plan. Monday's analysis did not mention the effect of this 55-minute gap. A reactor core isolation cooling system, which injects water into a reactor core in emergencies, began running at the No. 2 reactor in the time after the earthquake and before the tsunami. According to a TEPCO worker's log and other sources, staff switched the cooling system off and on trying to deal with fluctuations in the water level in the pressure vessel. The cooling system stopped working at about 1:25 p.m. on March 14, meaning it ran for about three days after the earthquake hit at 2:46 p.m. on March 11. After the cooling system failed, seawater was sprayed on the reactor from fire trucks starting at 4:34 p.m. the same day, but the water level continued to decline. By 6 p.m. on March 14, the tips of the fuel rods were exposed, and just an hour later they were almost totally out of the water, according to the report. Since water gauges for the reactors may have been damaged and are no longer accurate, TEPCO speculated on the situation inside the reactor cores based on worst-case scenarios, in which the water levels in the Nos. 2 and 3 reactors sank despite the injection of seawater. Based on these assumptions, TEPCO concluded damage to fuel rods in the No. 2 reactor began about 8 p.m. on March 14, an hour after the fuel rods were fully exposed. The rods melted and fell to the bottom of the pressure vessel by 8 p.m. on March 15. Eight hours later, or at about 4 a.m. on March 16, the bottom of the pressure vessel was damaged, according to TEPCO's analysis. Although "the worst" has likely happened, TEPCO said recent temperature measurements near the No. 2 reactor's pressure vessel showed the situation is relatively stable. If the water gauge is accurate, it would mean the seawater injection worked to a certain extent, meaning meltdown did not occur until at least a week after the earthquake, according to the report. It was early on March 13, or 36 hours after the Great East Japan Earthquake happened on March 11, that conditions at the No. 3 reactor began to clearly worsen. Though the No. 3 reactor lost its power source in the tsunami, TEPCO had managed to continue pouring water into the nuclear reactor, albeit with a gap of one hour, using two different types of emergency cooling systems--the high-pressure core flooding system and the reactor core isolation cooling system. However, the high-pressure core flooding system, which was considered the last resort, automatically stopped at 2:42 a.m. on March 13 because of falling pressure inside the reactor. The conditions inside the reactor drastically deteriorated after all batteries ran out and the reactor became uncontrollable. The reactor's pressure rapidly rose from 0.58 megapascals to more than 7 megapascals in only two hours. Operators tried to reactivate the reactor core isolation cooling system, but they could not. TEPCO then reported to the government at 5:10 a.m. that all functions to inject water into the reactor had been lost. Lohnt sich den Artikel dort komplett zu lesen. Not only the pressure vessels, but the containment vessels of the Nos. 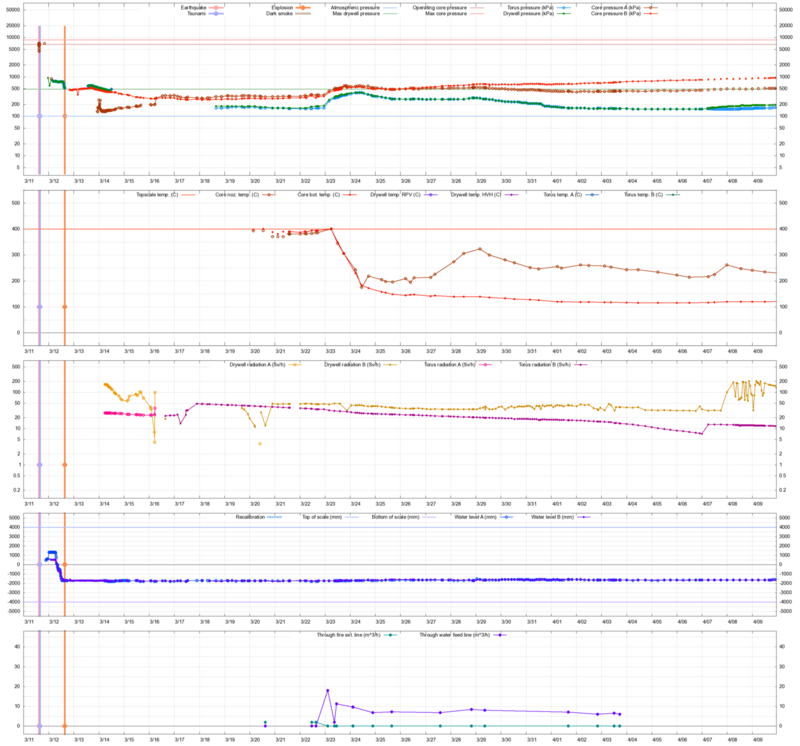 1 to 3 reactors at the Fukushima No. 1 nuclear power plant were probably damaged within 24 hours of the March 11 earthquake and tsunami, according to Tokyo Electric Power Co.'s analysis of the nuclear crisis. In a report on the analysis, the utility said it carried out minute calculations on internal pressure and other measurements in the nuclear reactors after the earthquake. Die PDFs am Ende jeweils enthalten sehr viel mehr Details! "4. The power interruption caused the main steam isolation valves to automatically close, disconnecting the reactor core from its normal heat sink and disabling the normal source of makeup water to the reactor vessel." "7. Around the time the isolation condensers were removed from service, there was an unexpectedly large downward step change in the indicated water level inside the reactor vessel." Mir fällt dazu das Dokument von Sheperd ein, [Blog#874]. Wurde das hier im Board schon berichtet, dass er das am 30.4. aktualisiert hatte ? (Sorry, ich war leider mehrere Wochen offline und habe ziemlich den Überblick verloren, was hier wo schon diskutiert wurde...). Damals nur eine Vermutung, doch im Zusammenhang mit dem Abfall des Pegels könnte das eine Erklärung sein. Ich würde jedenfalls das ECIC ganz schnell wieder abschalten, wenn aus dem Becken sofort die Blasen blubbern, obwohl der Pool noch nicht am Kochen ist. Eine Beschädigung des Isolation-Condensor Kreislaufs im Becken würde den Reaktordampf direkt ins Gebäude blasen und müßte sofort Strahlenalarm auslösen (die Elektrik war ja zu dem Zeitpunkt voll intakt, oder?) War das nicht die (verheimlichte) Meldung, dass nach Erdbeben vor Tsunami das Block1-Gebäude wegen hoher Strahlung nicht betreten werden konnte ? In den ersten 24 Stunden geisterte ja auch die unbestätigte Meldung durch die Medien, dass ein "wichtiges Rohr durch das Erbeben beschädigt worden sei". Dass es dabei um den Abriss der Hauptfrischdampfleitung (der GAU, den ein Siedewasser-Reaktor per Core Isolation beherrschen muss) ging, habe ich nirgendwo bestätigen können. Dass Block 1 keine Dampf-getriebene Notkühl-Pumpe hat, sondern im "Naturumlauf" (d.h. unter den aktuellen Druckverhältnissen) arbeitet, kam für mich erst durch den Sheperd-Vortrag ans Licht. Core isolation valves gehen zu - ECIC startet automatisch - der schnelle Druckaufbau reißt die durch das Beben vorgeschädigte Kühlschlange im Becken auf. Druckentlastung des Cores in das Becken=schnelle Wärmeabfuhr und Wasserverlust- Operator stoppt das ECIC - keine Not-Kühlung mehr. => Eine volle Packung "Frischdampf" hängt im Gebäude, ohne dass ein permanentes Containmentleck besteht. Ein anderer Grund für das manuelle Schließen des ECIC durch den Operator könnte der Umstand sein, dass das Becken ja weggekocht wird. Ich konnte es damals nicht klären, ob der Pegel im Notkühlbecken auch Auswirkungen auf das Abklingbecken hat. Wenn das zusammenhängt wäre mit dem ECIC sparsam umzugehen...das wäre aber auch ein wüster Designfehler, denn wenn es der Operator nicht schafft, die beiden Becken voneinander abzuschotten, hat er nur noch die Wahl, zwischen dem Meltdown im Druckbehälter oder dem im Abklingbecken. Was haben die Gamma-Sonden im Gebäude (vor allem das Penthouse und das Wasser im ECIC-Becken ist interessant) vor Eintreffen des Tsunamis und nachfolgenden Blackout noch angezeigt ? Da müssten auch neue Details, besonders zu R3, mit dabei sein. Wo genau liegen die (ich finde da auf die schnelle nur sich widersprechende bzw. mehr oder weniger ungenaue Flusspläne) und was wurde durch das Schließen dieser Ventile Aufgrund des den kurzzeitigen Stromausfall so alles abgeklemmt? BZW: wie gut ist VGB-Power_Tech S. 26? Wo wäre das das MSIV anzusiedeln? Das Schliessen dieser MSIV war doch eigentlich im Hinblick auf die Kühlung so nicht vorgesehen -oder? Warum hat man die MSIV nicht wieder geöffnet? Wie wichtig waren die MSIV für den Hergang? Gab es da den kurzzeitigen Stromausfall (Ausschalten der Turbinen nach dem Herunterfahren bei gleichzeitigen Verlust der externen Stromversorgung im Zeitraum bis die Notstromdiesel anspringen) der zum Schließen dieser Ventile führte nicht? Oder hat deren Personal die MSIV gleich wieder aufgemacht? etc. etc.? which DC power remains available." 1. Solange die Elektrik noch funktionierte war man aber eigentlich nicht auf das ECIC angewiesen, weil ja dann alle Haupt-, Hilfs- und Notkühlkreisläufe funktionsbereit waren. Jedes System davon mit vier unabhängigen Leitungen und Pumpen. Selbst wenn da mehr als eine Leitung durch das Beben abgerissen wurde, für die Kühlung würde eine intakte Leitung ausreichen. 2. Ich verstehe nicht so ganz warum man jetzt unbedingt einen Riss im Reaktorkessel durch das Erdbeben herbeireden will. Das Teil ist so massiv das man mit einem Panzer drüberfahren könnte. Das ist aber auch völlig egal, weil die Schwachstellen sowieso die Rohrleitungen sind. Wenn eine der vier Dampfleitungen abgerissen ist gelangt der radioaktive Dampf direkt ins Containment und/oder ins Gebäude, je nachdem wo die Leitung gerissen ist. 3. Wenn die Dampfleitung nun gerissen ist und gleichzeitig auch einige der Kühlleitungen, dann kam die Mannschaft wegen Dampf und Radioaktivität vielleicht nicht mehr ins Gebäude und konnte nicht feststellen welche Leitungen betroffen sind. Und dann wurden vielleicht nicht sofort die noch intakten Leitungen, Schieber und Pumpen verwendet - und dann kam sowieso schon der komplette Stromausfall. Arnie bezeichnet es als konzeptionelle Schwäche von BWRs, dass das Containment von so vielen Rohrleitungen durchlöchert ist. Die Konsequenz ist, dass man die "Core Isolation" Entscheidung treffen muss, bei der die nicht für die Notkühlung relevanten Rohre (nicht nur die dicken Frischdampfleitungen) dicht gemacht werden. Erst dadurch wird das Containment in seiner Rückhaltefunktion hergestellt. Ob der Abriss einer Frischdampfleitung irgendwo auf dem Weg zum Turbinenhaus nur dazu führt, dass die entsprechende Zufuhr gestoppt wird oder sofort ein CI abläuft, ist eine Frage der Ablaufprozeduren (Stichwort LOCA), die wohl automatisiert ablaufen müssen..
Ob sich dermaßen unter Druck geschlossene Ventile manuell wieder öffnen lassen, ist nicht nur eine Frage, welchen Vorschriften man folgt, sondern manchmal auch ein technisches Problem. Ich stimme dir zu, dass ein Erdbeben-bedingtes frühes RPV-Versagen wenig wahrscheinlich ist. Aufgrund der massiven Bauform des Containments halte ich es auch für wahrscheinlicher, dass eine Frischdampfleitung außerhalb abreisst. Es geht hier aber auch im die Frage, inwiefern ein notfallmäßig "isoliertes" Containment eine Erdbeben-induzierte Leckage aufweist, die den Wasserstand im RPV tiefer senkt als es durch den Dampfblasen-Effekt erklärbar wäre. Im CI-Modus wird das ECICziemlich schnell benötigt. Das ECIC Becken liegt außerhalb des Containments. Daher hat das Containment die Rohrleitungen zu diesem Becken als permanente Schwachstelle, es sei denn, man macht auch diesen Notkühl Kreislauf von innen dicht. Die Core Isolation Ventile liegen sicher innerhalb des Containments, wie es Sheperd in der Graphik andeutet. In der Areva-Graphik des VGR-Dokuments S.26 sieht man in einem Bild die beiden alternativen Isolation-Kühlsysteme der Serie3 (Block1) und Serie 4 (Block2,3). Dass Ventile außerhalb eingezeichnet werden, ist Platzmangel-bedingte künstlerische Freiheit. Laut Folie 11 wären die Möglichkeiten sogar mit Dieselnotstrom bereits sehr begrenzt. Allerdings wäre man bei BrownsFerry (S.17=P.6) mit 3 Dieseln pro Schaltzentrale wohl ganz zufrieden gewesen. Kann hier jemand diesen Wiederspruch auflösen? Entschuldigung komme gerade nicht mehr mit. In welchem Stadium sind wir ? @Mechtild: Die Reaktortypen wie Fukushima bei denen radioaktiver Dampf direkt zu den Turbinen geleitet wird haben in der Tat ein größeres Risikopotenzial. Bei einer Kombination von Störfällen ist da einiges möglich. "Eine Kernschmelze bedeutet eine Verschärfung der Situation ...da die weitere Kühlung schwieriger ist, weil das geschmolzene Metall in Klumpen viel weniger Oberfläche hat als die Brennstäbe vorher". Kommentar des Admin: ein "Experte" sollte ein fundierteres Wissen über den Ablauf einer Kernschmelze haben. Eine Kernschmelze läßt sich auch nicht in zwei Sätzen kurz erklären. Detaillierte Information zur Kernschmelze findet sich in meinem Skript http://www.tec-sim.de/images/stories/lecturenotes-late-in-vessel-phenomena.pdf oder meinem Vortrag http://www.tec-sim.de/images/stories/severe-accident-phenomenology.pdf zur Kernschmelze. Die Schmelze ist kein Metall und bildet keine Klumpen sondern ist oxydisch wie Lava und bildet einen Schmelzesee mit einer festen Kruste. Da die untere Kugelkalotte einen wahren "Wald" von Rohrdurchführungen aufweist, die wie Kühlrohre wirken, ist die natürliche Kühlung dieses Schmelzesees z.Z. sichergestellt. Da die Wärmeproduktion in dem Schmelzesee von Tag zu Tag abnimmt, war unmittelbar nach dem Störfall die Gefahr des Durchschmelzens durch die Wand des Reaktordruckgefäßes am größten. Da dies im März nicht eingetreten ist, ist es auch nicht mehr zu erwarten. Obskures Leck in der deutschen Presse. Sowohl SPON als auch die SZ melden, dass bereits vor dem Tsunami infolge des Erdbebens "Löcher" im Kühlsystem des Block 1 aufgetreten seien. Quelle ist ein obskurer TEPCO Mitarbeiter, der gesagt haben soll, dass die Störfallanalysen von TEPCO besser mit den Meßwerten übereinstimmen, wenn man ein Leck im Kühlsystem unterstellt. Das Besondere an dieser Meldung über "Löcher" ist, dass diese Meldung nicht in den japanischen Medien oder bei TEPCO zu finden ist, sondern nur in der deutsche Presse. Der Admin von www.tec-sim.de mag durchaus Ahnung haben. Leider äußert er sich in einem sehr überheblich Ton immer wieder über Andere..
Soweit ich es verstanden habe geben die Zircaloy-Hüllen sowie die Steuerstäbe und weitere metallisches Gestänge sehr gut die Wärme nach außen ab. Insofern ist das Statement nicht so falsch oder? Es sollen doch die Steuerstäbe bei einer Kernschmelze schmelzen und sich mit den Hüllen, Steuerstäben vermengen sagt man. Zuvor jedoch tropft das Zeug noch einzeln runter; solange noch Wasser da ist, sollen sich da kleine Klumpen zeitweise bilden. Es mag schon sein, dass die Ausdrucksweise nicht 100% korrekt ist, jedoch wie er selbst sagt, in der Kürze der Zeit die Medien dem Interviewten lassen, kann das mal vorkommen. Jedenfalls mit seinem besser wissenden Gehabe macht der "Admin" selbst keinen guten Eindruck. "Da die untere Kugelkalotte einen wahren "Wald" von Rohrdurchführungen aufweist, die wie Kühlrohre wirken, ist die natürliche Kühlung dieses Schmelzesees z.Z. sichergestellt. Da die Wärmeproduktion in dem Schmelzesee von Tag zu Tag abnimmt, war unmittelbar nach dem Störfall die Gefahr des Durchschmelzens durch die Wand des Reaktordruckgefäßes am größten. Da dies im März nicht eingetreten ist, ist es auch nicht mehr zu erwarten." "1) Schutz gegen den Absturz eines großen Verkehrsflugzeugs"
"Das Besondere an dieser Meldung über "Löcher" ist, dass diese Meldung nicht in den japanischen Medien oder bei TEPCO zu finden ist, sondern nur in der deutsche Presse." Stimmt doch voll und ganz. "Löcher" ist nämlich ein deutsches Wort. In den (englischen übersetzungen von) japanischen Medien reden die von "cracks". Das Reaktordruckgefäß ist aber weder ein Schmelzofen oder -tiegel, noch ein Konverter. Es hält das nicht aus, auch nicht, wenn Wasser drin "steht". Frage: Weiß zufällig jemand, wo genau die Wärmetauscher sitzen? Ich meine die, wo man im regulären Betrieb mit Seewasser das Prozesswasser zum Rücklauf in die Reaktoren kühlt? Und womit betreiben die ihre Notstromdiesel? Mit Diesel? Oder mit Schweröl?? Womit gewährleistet man in Fuk den Wasserdruck, außer halt mit Pumpen? Wassertürme konnte ich bislang keine erkennen - es gibt aber diverse Tanks und im Hinterland kleinere Seen, die scheinbar künstlich sind. Etwas schwer zu verstehen mit japanischem und englischem Sprecher zur gleichen Zeit. Die News ist schon paar Tage her; gibt jedoch n guten Einblick. Also einfach den linken "Lautsprecher" "abschalten"
Der Bericht ist aber an sich eine gute, kurze und sachliche Zusammenfassung (da war Greenpeace also wahrscheinlich nicht daran beteiligt, sondern den haben sie nur übernommen). Habt Ihr folgende Meldung schon gesehen? Laut EX-SKF schreibt die Yomiuri Shimbun, dass die NISA schon am Morgen des 12. März, also vor dem Venting von Block 1 Tellur-132 in der Luft gemessen hat, und zwar in Namie-machi, 6 km nördlich des Kraftwerks. Wenn dem so ist: Wie konnte das Isotop entweichen? Eine Meldung unter vielen. Wahrheit - Gerücht - Übersetzungsfehler - falsche Zeitachse - wie viel wurde gemessen - warum wurde überhaupt gemessen??? @Tim: Bezogen auf die Meldung Tellur-132. Hm. Ich schau mal. ob ich irgendwo Wetterdaten finde, aber in den ersten Tagen war die Windrichtung eigtl. ziemlich genau seewärts - der US-Flugzeugträger war ja noch weiter weg, als er umkehrte wg. Strahlung. Wenn der Messpunkt nördlich oder nordwestlich war und die Messwerte stimmen sollten, wäre das dann seltsam. @ eng: Hier die Bestätigung der obigen Meldung bezüglich des Te-132. Also der Wind blies am 12.3. ziemlich genau aus Nordnordwest... wie ist das mit dem Zeitpunkt der Messung, vor oder nach der Explosion? 05:44 The Prime Minister ordered local governments to advise people within 10 km of the Power Station to evacuate. Das wäre dann ~8:44 AM am 12. März. Vielleicht kommt die Tage ja noch genaueres von offizieller Seite. Auf jeden Fall hat das System wieder danach Druck aufgebaut, es kann also nur ein Ventil oder etwas ähnliches gewesen sein. Gibt es eigentlich Reissscheiben als "back-up" für das Containment, die man über Ventile wieder schliessen kann? Dann ließe sich die Messung mit dem Seewind erklären, also lokal, also die thermische Ausgleichsströmung nachts tags, siehe http://de.wikipedia.org/wiki/Land-See-Windsystem. Ok, dann passt das doch alles zusammen. Die einzige Lücke, die noch bleibt, sind die knapp 5 Stunden Zeit bis zur Anordung der Evakuierung. Auch die Probennahme am nächsten Morgen macht dann Sinn zur Bestätigung der Anordnung. Mit Reisscheiben sind vermutlich Berstscheiben (Überdruckscheiben) gemeint, die bei Überdruck bersten um das System zu schützen. Angeblich soll FUK ja Überdruck-Ventile haben. Die müssten dann eigentlich bei Überdruck automatisch öffnen und bei Druckreduzierung auch wieder automatisch schließen. Wenn ich die Meldung richtig verstehe hat das Ventil schon nach kurzer Zeit Druck abgelassen. Aber warum gab es dann anschließend Probleme bei der erneuten Druckentlastung? - Hat das Ventil jetzt einmal funktioniert und dann war es defekt? - Oder wurde das Ventil manuell blockiert um ein nochmaliges automatisches Öffnen zu verhindern?